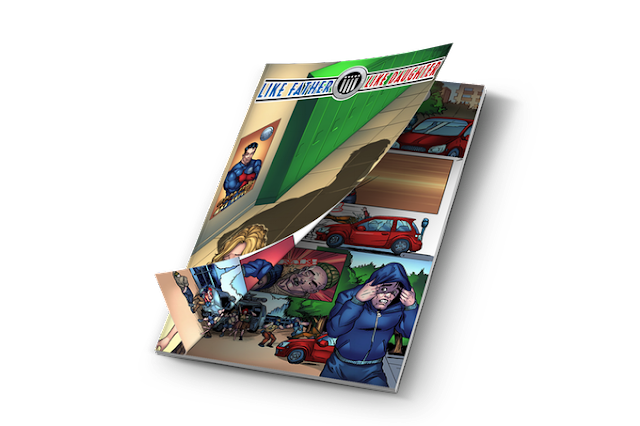 Our very own Kat “Comic Uno” Cal has launched her second Kickstarter along with the help of Short Fuse Media to make Like Father, Like Daughter #2 a reality. Now, I’m going to Kickstart the Week with Kat and Like Father, Like Daughter artist Wayne Brown about the project. Casey Ryder would be your typically teenage girl… if her life weren’t even more complicated than that. She is the daughter of the world’s only superhero, Invulnerable. Her superhero dad left Casey and her mother when Casey was still young in order to be a hero. Now, Casey has a lot of rage against her father. Even worse, she has just manifested her own superpowers. Will she put them to good use in this issue? 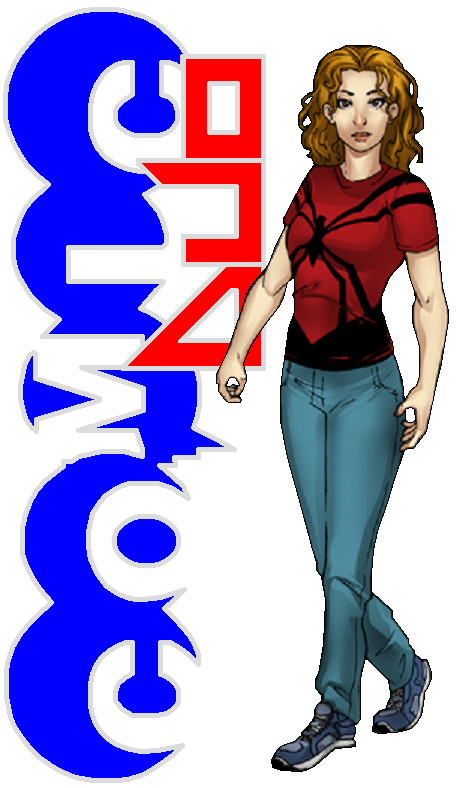 The comic book is written by Kathryn Calamia, better known as the Youtube sensation Comic Uno. 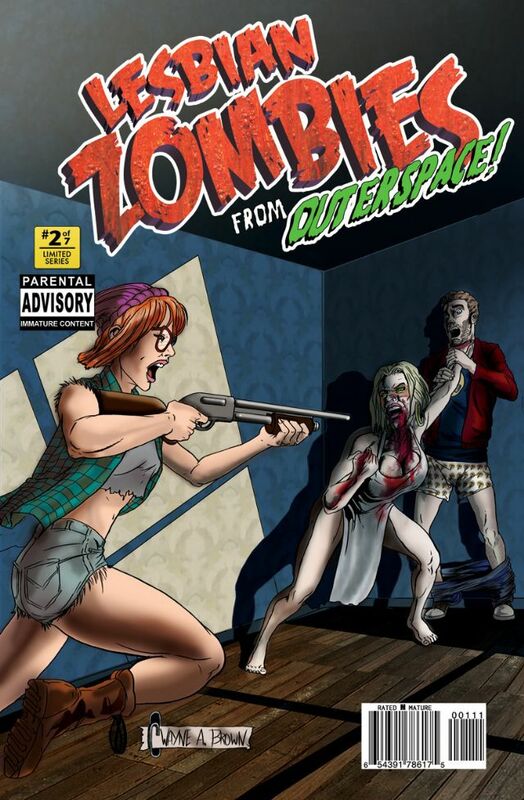 The artist is Wayne Brown (Lesbian Zombies from Outer Space). He created the character designs for background characters. 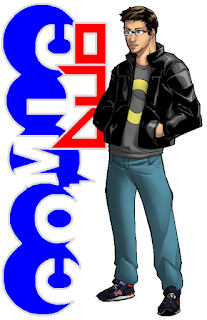 Invulnerable, Casey and her friends' character designs were developed by several concept artists based on Comic Uno's descriptions. Like Father, Like Daughter is being publisher by Short Fuse Media. 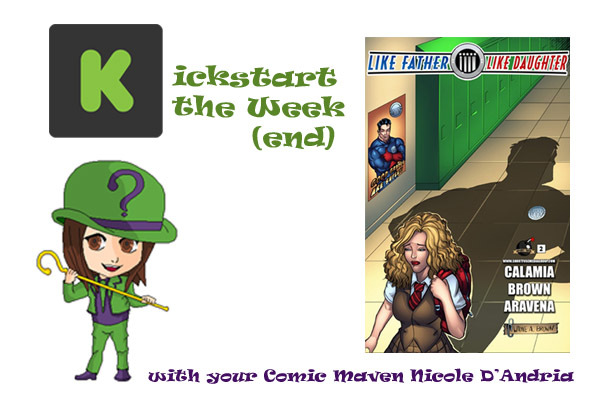 The Kickstarter for Like Father, Like Daughter #2 is trying to raise $4,500 by October 11, 2015 at 8:00 PM EDT. You can get a PDF copy of the first and second issues of Like Father, Like Daughter for $5 or more. There are more rewards the higher you pledge which include t-shirts and action figures. 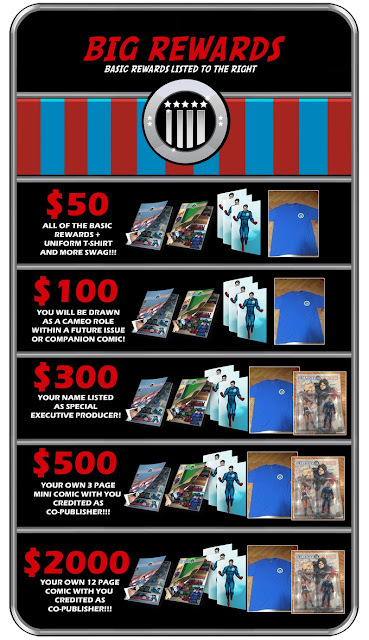 You could even become part of the Like Father, Like Daughter comic book universe. You can back their Kickstarter here. Me: What do you think is the number one reason people should back the Kickstarter for Like Father, Like Daughter #2? Katherine Calamia: After the events of the New 52 and One More Day I have been hearing more and more comic fans wanting marriage and family themes back in comic books. Like Father, Like Daughter is a superhero book, but it's also a book about family. It's about the relationship between a father and daughter. Me: I know Like Father, Like Daughter was originally a screenplay for a class you were taking. 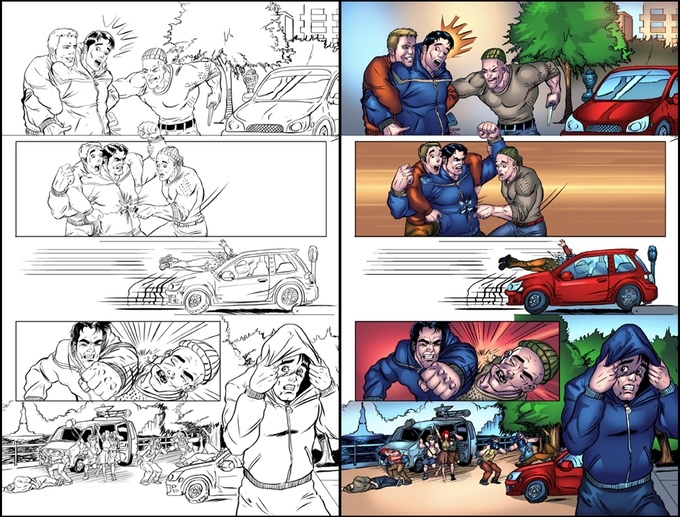 Did you know when you were first writing that it would turn into a comic book? Calamia: Not at all. When I was writing the screenplay I thought about the story as a movie. A couple of months after I took the class I saw the screenplay on my desktop and I really wanted people to experience the story I had written. I re-read the script and realized the story fit perfectly in the comic book medium. That whole summer I worked on converting my screenplay into a comic. I got in touch with Short Fuse Media and now we are working together to make this comic book series a reality. Me: How did you first come into contact with Short Fuse Media? 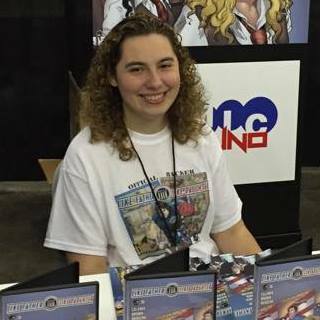 Calamia: When I decided to make my screenplay into a comic book, I made a video on my Youtube channel looking for an artist for the book. 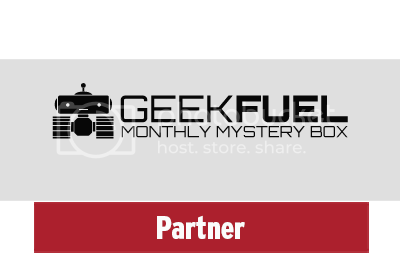 Shortly after Short Fuse Media contacted me and we started working together. Me: How did you meet and decide on an artist for Like Father, Like Daughter? Calamia: When I first started working with Short Fuse Media they asked me what type of artwork I wanted for the story. I knew I wanted artwork that really showed facial expression and I think Wayne is a perfect fit for the type of story we are telling with Like Father, Like Daughter. Me: Are there any plans to make a sequel series when this mini-series is over or to create other stories that take place in the same universe? Calamia: As of right now I am concentrating on the Like Father, Like Daughter series itself, but we do have a webcomic that connects to the Like Father, Like Daughter universe. The next story is going to introduce Comic Duo to the universe. Me: What can you tell us about the Comic Duo? I know when you first started reviewing with your friend Luke you were known as Comic Duo. Is there a connection there to the Comic Duo in the webcomic? Calamia: When I started my YouTube career my show was originally called Comic Duo. 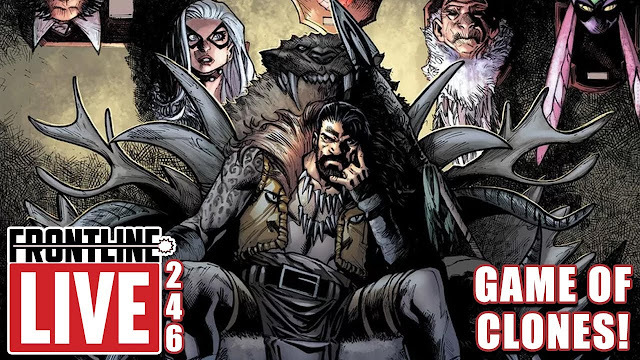 My friend Luke and I did comic book reviews for about a year, but he then fell out of comics. I continued the show as Comic Uno. Luke is still my best friend and has been on a couple of my Comic Uno videos. So one of the backers from Like Father, Like Daughter #1 wanted a story about Comic Duo. So now this upcoming webcomic is going to be about adding Comic Duo into the Like Father, Like Daughter universe. Me: What inspired the idea for the story? Calamia: A lot of the things. 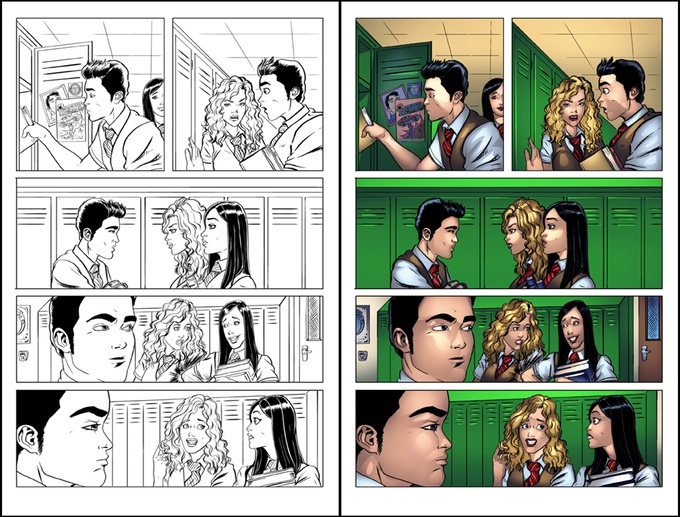 When I first started plotting the story I knew I wanted to write a high school superhero story. I always tend to gravitate towards those type of stories. I also knew I wanted to make a commentary on modern comic books. I have been reading comics all my life. I know the tropes and I wanted to play with them in this series. Me: What are some comic book tropes that you touch upon in your comic? Calamia: The biggest one being the image of a superhero and celebrities in general. People want heroes to be perfect. They save the world and try to do the right thing, but the public doesn't know who these heroes truly are. Invulnerable wants to use his powers to help people, but leaves his family to do so. This story is not told in Invulnerable's point of view, but instead the point of view of his daughter. Another recent trend in comics is single superheroes. Comic companies have broken up superhero marriages to make heroes more "relatable" to the public, but I think telling a story about family is one of the most relatable stories you can tell. Me: You mentioned that there is a new character being introduced this issue, Wes, the “superhero-walking dictionary”. Can you tell us a bit about his character and his role in the story? him. He knows everything about superheroes and that becomes very important because this is a world where superheroes are real. Me: If you developed superpowers one day, what powers would you want and what would you do with them? Calamia: I get this question a lot. I would have to go with flight because I am afraid of heights. And really the fear of heights is the fear of falling. So if I can't fall that means I won't be scared of heights anymore. What would I do with my powers? I probably wouldn't be a superhero. I would just lazily use my powers. I want McDonald's then I am going to fly to McDonald's. I don't have to worry about traffic. Me: Say Superman and Invulnerable got into a fight... who would win and why? Calamia: Superman no doubt. When I created Invulnerable I didn't want to make him over powerful. So he can run fast, but he can't run at the speed of light. He has super strength, but he can't pick up an elephant. Me: You’ve had some great success with Kickstarter in the past and were able to raise 20% of your goal for this issue in a day. To what do you attribute this success to? Calamia: I have great friends, family, and fans. They are there to support me and I am so grateful for that. Like Father, Like Daughter and Comic Uno wouldn't be where they are now without them. Me: What tips can you give to people interested in launching their own Kickstarter? Calamia: Do a lot of pre-planning! Know where you need to promote your project and know how much money you need to raise. Me: How did you break into the comic book industry? Wayne Brown: Lol, I kind of feel like I am still waiting to do that. I don’t really feel like I’ve broken into the industry. I’m drawing and have some great projects I am working on, I have a full workload, so I’m thrilled to finally to be working at what I love to do. But I don’t think I broken into the industry, I feel more like I’m skirting around the edges looking for the main gate in. Me: How did you become involved with Short Fuse Media and Katherine Calamia? 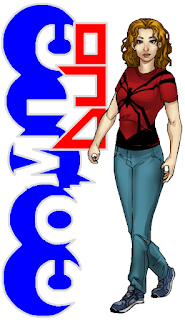 Brown: I answered an ad on Digitalwebbing.com (I think) for Short Fuse Media, and showed them my deviant art page. I started on a webcomic for them called Deadly Alana. I did like six pages before I was replaced by another artist who fit the style they wanted for the series. That was heartbreaking but that’s the business. Luckily what I did for Like Father, Like Daughter was just what they wanted. I’m so happy too because I love the characters and the story. Kat has this whole great set-up and I can’t wait to see what she does next for these guys. I can tell you that issue two is going to be a homerun. 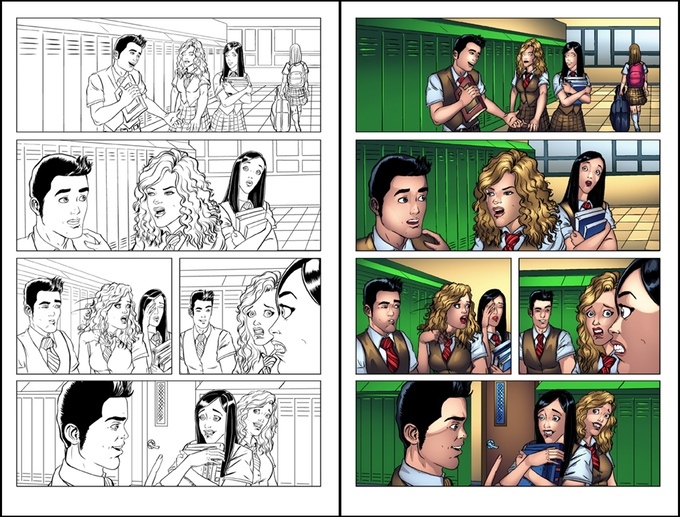 I think my art was way better than the first issue. And the characters become more alive, you’ll see. Me: How would you describe your art style and how it fits with Like Father, Like Daughter? Brown: Bubblegum Joe meets the attack of the crazy cartoonist from inner space, baby! I love a nice, simple, clean style and always seem to overdo it. My influences are huge. Back when I started, the influences were different in style and techniques. I started drawing by hand and inking with a brush like Will Eisner and Wally Wood (huge artist from the golden era). Marc Silvestri and Todd Mcfarlane were the influences that made me want to become a comic book artist. Today I really love Frank Cho and Terry Dodson. My style has made a huge change since going from paper to paper. I decided about three or four years ago to go totally digital. I rarely pick up my old pencils and pens. Everything is moving digital and I figured I should do it now, before it’s required. Me: How would you say your style changed when you switched to digital? Brown: Well, switching to digital from paper drawing at first is like learning to draw again, only using your left hand when you’re right-handed. The change is difficult at first, especially when I started a few years ago. I had a small Bamboo, which is a pen and tablet that lays flat on your table like a mouse pad, and you look up at your screen while your hand draws the curser across the screen. Just like you use your mouse, it’s difficult but it allows you to use pressure like a pen or pencil. Drawing like that was hard and uncomfortable and made some of my lines look sketchy, whereas when I use a brush on paper I could control the look of a line with a small twist of my wrist. Now I have a 19” tablet with the monitor built in it. I can see and twist my wrist and get lines like I used to, but it’s still different. So I would say my style changed due to technology. It’s a different tool that achieves a different look. My cartoony style on paper, the lines look different than the ones I draw on screen. Because of that I’ve had to change how I draw some things in order for them to look nice, but that is always an ongoing process for an artist. Me: I know you mentioned how you felt everything is moving to digital art. Is that where you think the comic industry will be in ten years? Do you think traditional art with pens and pencils will become a thing of the past? Brown: I would say that question is ten years ago old. Because back then we were scanning and using Photoshop to color, letter, clean and scan. Yes, it started out as paper drawing but after it was completed it was manipulated to become completely digital. Over those ten years new software and hardware were invented to completely integrate paper art to digital. The medium is really different, but with the release of these new technologies that gap between digital and paper has closed really fast. Like I said, earlier this year I bought a 19” monitor tablet to replace my old Bamboo because I was able to find one I could afford. As these technologies continue to increase and get better, they are becoming more affordable and available. With software and equipment that can do the things we did with paper. We don’t have to buy paper, graphite, and erasers, clean up the scrap from the floor and pile the stuff we want to keep on a desk. I don’t need to trace and photocopy to enlarge, to use a tee square or French curves, to buy gallons of ink and whiteout. All of that is done with the push of a button which now can be e-mailed to an editor, colorist, letterer, publisher, printer, etc., which used to take days and weeks but now takes a few minutes to e-mail or publish directly to a website. No scanning, no photocopying. You’d really be surprised how these changes can streamline the old process which used to take months so now it only takes weeks or days. Now hand drawing will never disappear from comics. I still draw by hand, really I do, it’s just paper and graphite are not used, it’s all tablet and computer. The software I use is great and feels like I’m drawing on paper, only I don’t have to buy paper, graphite, erasers, etc. Everything is available online and in the software. I feel freed from having to buy loads of paper and supplies. I still draw and ink and paint by hand, but only for fun. Work is on a computer. Now I feel great because I can go either way. Those years I spent learning to draw and ink with a brush and graphite have helped me to become a well-rounded artist. It has helped me fill in the gaps that still exist between paper and digital, but that’s what experience always does: fill in those gaps that pop up. Now, drawing using a computer instead of paper is not a good or bad thing, it’s just the way the business has changed. There will always be hand artist that will be scanned digitally. Again, ten years ago was when it started. Now, that’s a step to be avoided by drawing right on the screen, and as those gaps become filled in soon you will see everyone using them in some regard. Like how paper replaced stone. The times have changed and will continue to do just that, but paper art will always remain. It will become a lost art form, but many will still do paper drawn comics over digital drawn comics and conventions will still have artists using the pencil when a digital screen is not available. But it is already being replaced. It may take another ten years, or 20, before it completely dominates the market, but it will happen eventually. But artists will still draw by hand. It will just involve a computer screen or a piece of paper. 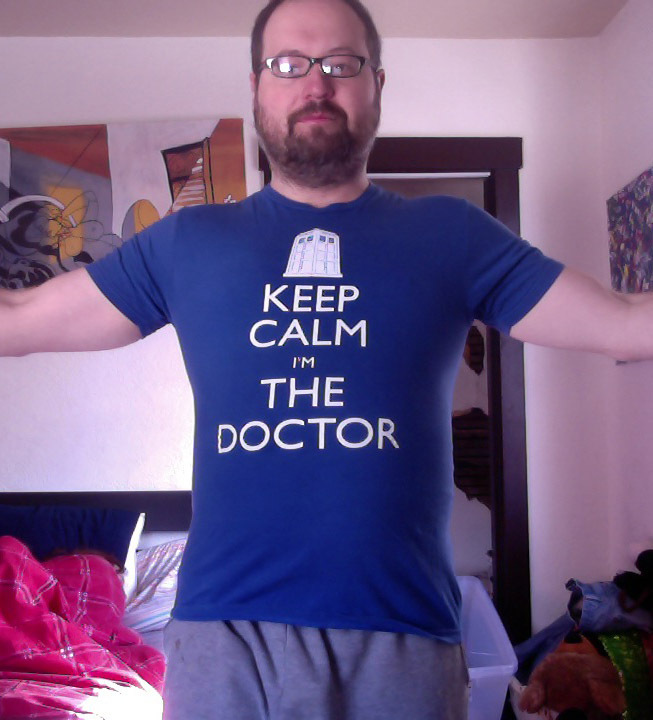 It still will be art and comics and we will all love them regardless. Wow! I feel like I just gave a lecture to a classroom, lol. Let’s move on to the next question before we’re here all night on this question. Me: How did you come up with the character designs for Invulnerable and the rest of the characters in Like Father, Like Daughter? Brown: It was really easy. Kat gave me detailed descriptions and photo references to model the characters. It was probably the easiest character designs I ever had to do. It was awesome. Me: Who is your favorite superhero to draw and why? Brown: Obviously it’s Invulnerable and Casey, they are awesome. I really haven’t done a top comic hero in a long time. But my favorite comic book heroes have always been Green Lantern (Hal Jordan) and Captain America (Steve Rogers). They were the good guys. Call them boy scouts or goodie goodie, but they stood for something better than we have now, that has always inspired me. Brown: If I could have any superpower it would be invulnerability. I always fantasized about being indestructible, bullets bouncing off me, walking through fire, etc. Of course, you also have to have super strength. Nothing more manly than being able to take a beating and keep on getting off the floor. It’s inspiring the will and strength to overcome defeat. It’s epic. Me: What are some of the other comic book series you have done artwork for that were the most memorable to you? Brown: Wow, that is a hard question, and I hope you don‘t mind if I give you different answers. In 28 years I have created and worked on so many books you never will hear of or could ever know about. But for me they have become a part of my family and who I am, so I’ll skip over most of those books and characters that are lost and never seen. Brown: In 28 years, success has come and go. In life I have a wonderful wife (who proofreads) and four great children. It has been hard to keep this love of drawing comics alive and support my family, but with the digital age, the web, and websites and comics, you can find your path and success as long as you stay true to your passion. Keep getting up when you get knocked down. Find art you love and artists you love. 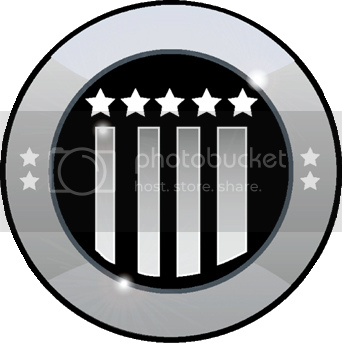 Study what they did and see how you can do it. Experiment, play, keep yourself young at heart and you’ll be great. Even if you never make a big splash, you’ll at least be swimming in the pool. And that’s fun. Me: Thank you for your super responses! 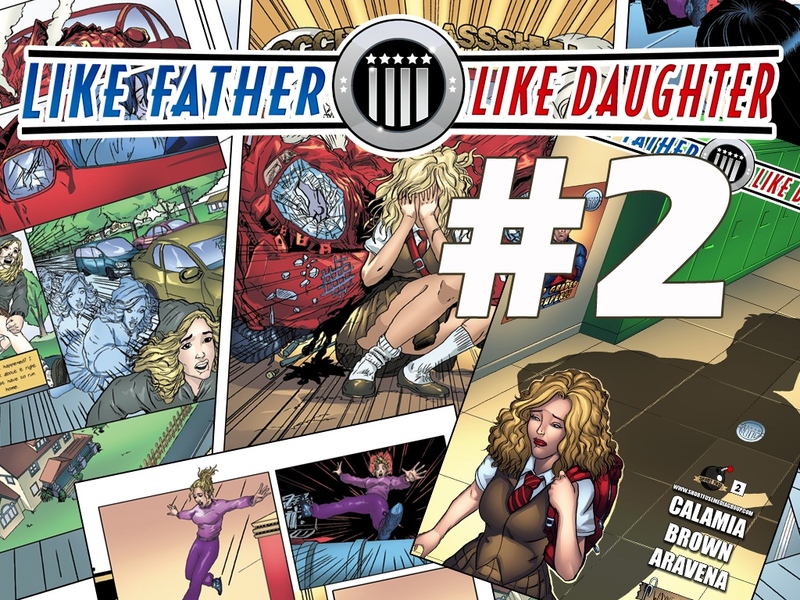 You can back Like Father, Like Daughter #2 on Kickstarter. Support Like Father, Like Daughter On Patreon! Like Father, Like Daughter #2 Kickstarter Launches Saturday!